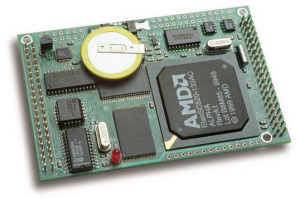 C/C++ programmable microprocessor module based on a 40 MHz, 16-bit CPU (Am186ES, AMD). Ideal for industrial process control and high-speed data acquisition. In addition to offering a 16-bit external data bus, the AE86 supports on-board 512 KB 16-bit Flash and up to 512 KB 16-bit battery-backed SRAM. Measuring 3.6 x 2.3 x 0.3 inches, the A-Engine86 (AE86) is a C/C++ programmable microprocessor module based on a 40 MHz, 16-bit CPU (Am186ES, AMD). The AE86 is ideal for industrial process control and high-speed data acquisition. In addition to offering a 16-bit external data bus, the AE86 supports on-board 512 KB 16-bit Flash and up to 512 KB 16-bit battery-backed SRAM. All chips are surface-mounted. The on-board Flash can be easily programmed in the field via serial link using the ACTF kit. With its 16-bit external data bus, it can normally achieve performance that is almost twice as good as those of the other A-Engine variants based on the Am188ES microprocessor. A real-time clock (RTC72423) provides information on the year, month, date, hour, minute, second, and 1/64 second. A 512-byte serial EEPROM is on-board.Two DMA-driven serial ports support communication up to 115,200 baud. A third UART SCC2691 may be installed. A high-speed, 300K samples per second, 8-channel, 12-bit parallel ADC (AD7852) can be installed. This ADC includes sample-and-hold and precision internal reference, and has an input range of 0-5 V. The AE86 also supports a 4-channel, 5 ms settling time, 200 KHz parallel DAC (DA7625, 0-2.5V). On-board 16-bit programmable timers/counters can be used to count external events or to generate PWM outputs. Pulse Width Demodulation (PWD) can be used to measure the width of a signal in both its high and low phases. The AE86 provides 32 multifunctional I/O pins from the CPU, plus 24 bi-directional I/O lines from a PPI (82C55). Schmitt-trigger inverters are provided to increase noise immunity for external interrupt inputs. A supervisor chip (691) provides power failure detection and a watchdog timer. A serial 12-bit ADC (P2543) may also be installed, offering 11 single-ended 0-5V inputs with a 10 KHz sample rate. A 2-channel 12-bit serial DAC (LT1446) provides 0-4.095 V analog voltage outputs capable of sinking or sourcing 5 mA. The 82C55 PPI can interface to an LCD and keypad. The A-Engine-86 shares many similar features with the A-Engine, as well as a similar pin-out and physical dimensions with the i386-Engine and V25-Engine-LM. The slightly larger A-Engine-86-P (AE86-P) provides the same basic features as the AE-86 and provides a few other integrated functional units. The AE86-P provides an on-board switching regulator that allows the controller to accept a wider range of input voltages. It also has on-board RS232/RS485 drivers for the serial ports. The standard AE86 requires the use of an expansion board such as the VE232 for standard operation (unless your OEM board can provide a 5V regulated voltage supply and RS232 voltage-level drivers). The AE86-P provides that functionality on-board. Another variant of this family of boards is the A-Engine-86-D (AE86-D). Similar to the AE86-P, the AE86-D is an integrated controller with on-board voltage regulators and serial port drivers. In addition, the primary feature of the AE86-D is that it offers three external 16-bit counters. These counters are ideal for specialized applications that deal with high-frequency external events… such as the output of flow meters. The AE86-D is also designed for other flexible applications. It offers another DA7625, providing 4 more channels of high-speed parallel DAC. The AE86-D can also be optionally configured with a RS422/RS485 driver for SER1, instead of the usual RS232 design. On the spectrum of performance power for TERN controllers, the AE86 boards would probably be placed right in the middle. On the fewer feature/lower-performance (and lower-cost) side, there are products such as the A-Engine, FlashCore-B, and R-Engine. If you’re looking for more processing power in a similar small profile, check out the i386-Engine and 586-Engine. For Ethernet capability, take a look at the Ethernet-Engine controller.